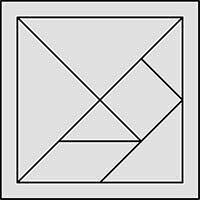 A Tangram Chinese dissection puzzle. We offer in a few sizes but can cut other sizes on request. A base can be added so that the outer square so all the shapes can be stored in. We can cut individual items from the Tangram or whole Tangrams up to 40cm by 40cm. We can also cut in colored acrylic, felt or foam that would make a great teaching resource. For more details please contact.